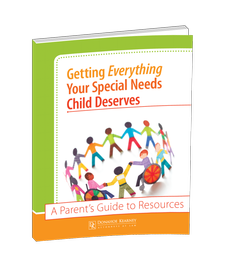 We have spoken with many moms of a special needs child who ordered a free copy of our guide new and improved, Getting Everything Your Special Needs Child Deserves: A Parent's Guide to Resources, she was very grateful for the tips in the guide book. As medical malpractice lawyers in D.C., Maryland and Virginia, we developed and published this guide to resources based on our experience working with many families over the years who have been affected by medical malpractice. But you don't have to have a medical malpractice case to get it - we think its a good thing to do for parents in the community. So even if your child's medical condition wasn't caused by anything a doctor or hospital did or should have done, call for a copy of this free guide. It probably won't have everything you and your child needs, but its a good place to start. And if you know of a great local resource for disabled or special needs kids, please let us know so we can include it in the next edition. If you have any questions regarding medical malpractice, contact us at (202) 393-3200-- it's free and confidential!